Agenda as standalone or exhibition app. Show up to 31 days in advance. Options how to handle all-day events. Show calendar color next to event. Show ubercalendar icons next to event. Show time until event and time since start of event. Show time of event and duration or start and end time. Select which calendars you want to see. "Just Type" support, you can also just type from inside the app. Tap header to jump to a certain date. Tap dates or entries to open calendar on this day. Swipe left or right to advance or go back in time. Have AgendaZ auto launched to reflect the date on its icon. 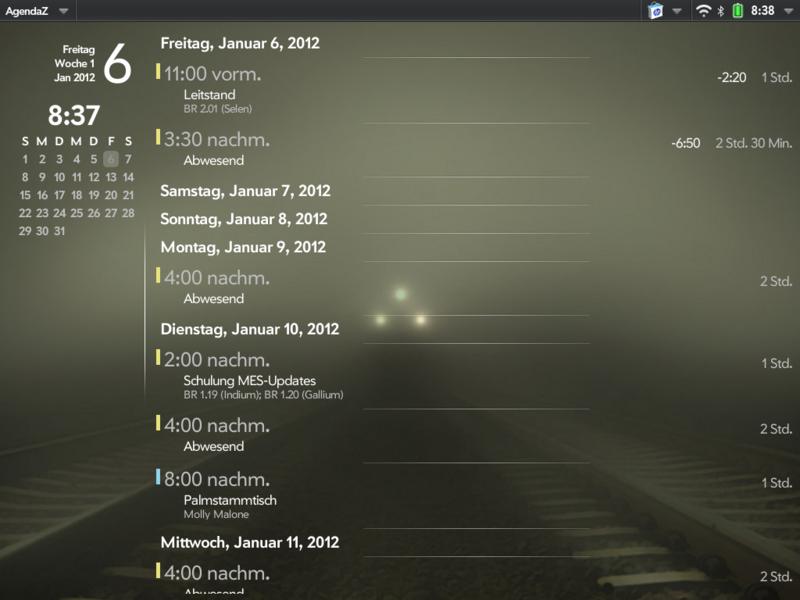 Show your agenda in "Just Exhibition" on your TouchPad. If you like it, please buy some of my apps from the catalog. Check out the help menu item to see what I offer. Regulary exporting agenda list for use in "Just Exhibition"